A proposal that raised a flood of concerns among residents in the Robbinsdale School District now heads to a city council vote. The New Hope Planning Commission this week heard the pros and cons of expanding the use of the Cooper High School football stadium to people who live outside the district. 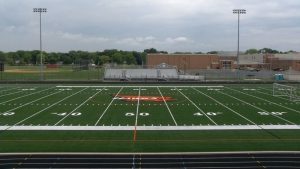 Under the proposed changes to the district’s conditional use permit, the use of the stadium would no longer be limited to youth, opening up its use throughout the year to adults. There would also no longer be a residency requirement. Currently for groups that hold events at the stadium, 50 percent of the users must live in the district. Cooper High School Football coach Willie Howard believes it’s important to open up access to outside groups. “If I wanted to bring some of my ex-Viking teammates to put on a 7-on-7 adult fundraiser for our kids. That it’s open for that possibility. Because right now we are landlocked to be able to say I can’t even open up that opportunity, which I feel as though it’s a great opportunity for our kids to be able to experience this, but unfortunately we can’t,” said Howard. Howard says other cities allow this kind of use at their high schools, listing Burnsville, Minnetonka, Hopkins, East Ridge high schools as examples. Similar to a meeting that was held March 5, residents who live near the stadium raised concerns about livability issues. They also wondered how problems would get addressed. “Now for the second meeting in a row, you’ve got a room flooded with people telling you how our lives and our livability and our enjoyment of our neighborhood are affected by the traffic, and the sound and the trash,” Amira Friedson told the New Hope Planning Commission. The proposal would expand the use of the stadium’s PA system. It would allow up to eight times per year for non-district events. The chair of the New Hope Planning Commission also wanted to know what the district would do about garbage cleanup. However, despite reservations, the New Hope Planning Commission did recommend approval to expand use of the use of the stadium. The vote this past week was 6-2. The New Hope City Council now takes up the issue at its April 22 meeting.